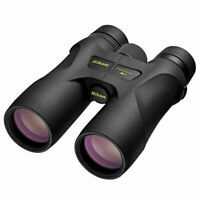 Look across the field, across a wooded area, or across the street with this pair of 12x42 Nikon Monarch 5 binoculars. These lightweight and sleek Nikon Monarch 5 ATB binoculars boast an uncontested heritage of all optical conditions and performance with improved agility, a wide field of view, and advanced low light brilliance for eye relief in less-than-ideal viewing conditions. Whether you need to see into the distance for hunting or for watching birds on the roof across the street, this 12x magnification binocular gives you the powerful optics you need. 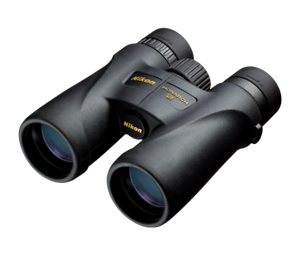 These Nikon Monarch 5 binoculars feature the company’s legendary extra-low dispersion glass lenses that correct chromatic aberrations across the furthest limits of the visible light range for effective compensation for color fringing. If you wear glasses or contacts, you can still enjoy the enhanced optics and expanded field of view when you adjust the focus of the exit pupil in these Nikon Monarch binoculars. The ergonomic high-eyepoint design of this pair of binoculars provides a clear field of view for everyone, with sufficient space between the user’s brow and the binocular eyecups. If you enjoy hunting and using a binocular set instead of spotting scopes for viewing prey on the horizon, you’re likely to get caught in inclement weather from time to time. When you replace your scopes with these compact, fogproof, and waterproof Nikon Monarch binoculars, you don’t miss any action and you will enjoy the value of being able to focus the binocular set quickly in order to find your target. Clarity is everything when it comes to binoculars, and features that let you adjust the focus are key in being able to see long distances. The dielectric high-reflective multicoated surface of prisms utilized in the lens and prism surfaces of these Nikon Monarch binoculars maintains the same degree of brightness at the vortex of the binocular prism as perceived by the naked high, with clear high-contrast images displaying accurate color reproduction. If you’re headed out for a hiking or any other active excursion, tuck these Nikon Monarch binoculars in your accessories, like a backpack or duffle bag, so they’ll be handy if you spot wildlife or even a unique tree that deserves a closer look. Tuck your Nikon Monarch binoculars in a case or stuff them in your tote bag as accessories to the fun when enjoying a day at the beach, or a day hiking n the woods. 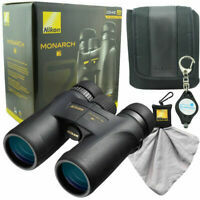 This is for the 12x40 monarch5 binos. Have had many cheap pairs of several brands over the years as well as a couple pairs of spendy ones. These are bar none the best bang for the buck I've ever found. Excellent optics and very compact user friendly for the money. Extremely satisfied with these glasses. Me and my husband are very satisyed with the high quality of these binoculars..they are clear vision in low light, light weight, we used them for hunting, here in north Idaho in all weather conditions, and they met our expations. We are very happy with them. Small and light with very clear glass. These binos are very compact and light weight, but they are sturdy and well-built, just like all the optics made by Nikon that I have used. The glass is so clear and bright. They compare favorably with Steiners, Vortex, Leupolds, and others that cost much more but cannot outperform these Nikons. For the price I paid, there is no better deal on quality binoculars anywhere. If you need more magnification for judging animals or just to get more detail on whatever you are glassing, you won't be sorry if you buy these. These are nice glasses..not top of the line optics by any means nor are they top of the price chart. At 12x power you need a steady grip, any stronger & a tripod mount would be needed. For the price the build quality, although Chinese made is superb..I doubt they will disappoint.